Manolo for the Beauty | Manolo for the Home | Crafty Manolo | Manolo Moda | The Basement of the Bargains | Super Fantastic Newsletter |Talk to Manolo! Since the start of 2011, twenty-four dolphin calves have been found dead on shores of Alabama and Mississippi – about ten times what’s normal. Scientists, as you might imagine, aren’t happy about what that number says about the health of the Gulf of Mexico. No one’s shouting BP! 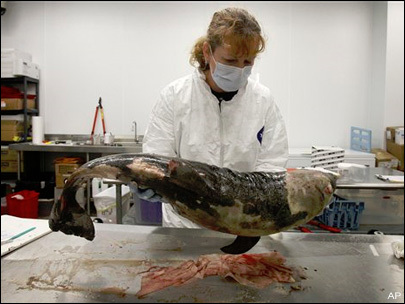 BP!, but the folks investigating the circumstances behind the dolphin deaths aren’t ruling out after-effects of the oil spill as a potential cause. Make of that what you will, since the jury is still out. The IMMS said it has been able to perform full necropsies on a third of the 24 calves. The majority of the calves were too decomposed for a full examination, but the institute has taken tissue samples for analysis. While none of the 30 dolphins were found with any oil on them, Mase said the agency is not ruling anything in or out on the cause of death. There are plenty of possibilities. Six of the bodies were found intact enough for dissection, and were found to be a mix of stillborn, premature, and full-term calves that died shortly after birth. Marine mammals like dolphins are particularly sensitive to algae blooms, diseases that spread through pods, temperature and environmental changes, and of course, human impact. Which means that it could be anything. But when we’re seeing 10 times the normal number of dead dolphins washing up on shore over in an area large enough to indicate multiple pods may be involved and scientists are calling the numbers “unprecedented,” something weird is probably going on. Right? I would never argue that a person can’t eat meat sustainably, though I’ll certainly argue that most people don’t. Which makes sense, because for a lot of folks, organically farmed meat and humanely raised meat are cost prohibitive. So sometimes the easiest way not to be a part of the abuses and pollution that are the hallmarks of the modern factory farm is to eat less meat or even no meat at all. The only problem is that meat is totally tasty, and it’s familiar, too. Which means that a lot of us vegetarians and sometimes vegetarians gravitate toward faux meats or fake meats or meat analogs or veggie meats. But is switching to meat analogs better from a green standpoint? In conventional production, a kilogram of raw [soy] beans generates about 150 grams to 300 grams of carbon-dioxide equivalent, as opposed to 2,500 grams for the equivalent quantity of edible chicken meat. But since faux meat can also be totally tasty, people are going to eat it. And let’s not forget tofu, which some people use in place of meat and even eggs or cheese in their cooking. Speaking of, back in 2009, Slate’s Green Lantern looked into how green tofu et al. is compared to various meats. While tofu naturally beat out factory farmed beef by a mile, it performed only slightly better than chicken and fish. Last year, the Dutch government commissioned a study of the environmental effects of vegetarian “meat substitutes,” including veggie burgers, Quorn and tofu. According to the analysis, a kilogram of tofu sold in the Netherlands produces about two kilograms of carbon-dioxide equivalent from the farm to the supermarket. That’s only a little less than Dutch chicken, at 3 kilograms of CO2-equivalent per kilogram of meat. Mackerel, herring, pollock and mussels — some of which the Lantern has already championed as low-carbon options for seafood lovers — scored about the same or better than tofu. That’s a much smaller difference than the Lantern would have expected. Full disclosure: I love Grillers Prime veggie burgers. I loved them before I became a vegetarian. Meat analogs have always been on my menu. But green they are not. My veggie burgers come wrapped in plastic in packages of two inside a cardboard box. My veggie meatballs are sealed inside a non-recyclable plastic package wrapped in a cardboard sleeve. Some of my favorite mock meats come individually wrapped inside even more packaging. BUT I should add that the fake meats you make at home from scratch are an entirely different… ahem, animal. We’ll occasionally make homemade seitan (from the recipe in this book and there are tons of great burger recipes out there. 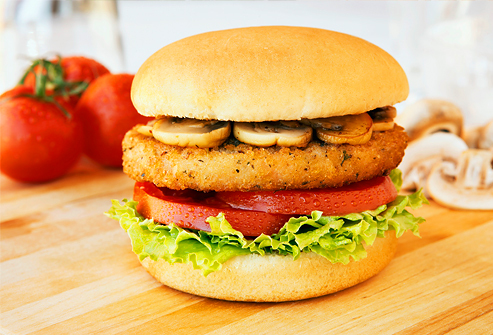 Do you have a favorite veggie burger recipe? How heavily do meat analogs feature in your diet? 1. When you buy organic dairy products, you’re supporting a system of agriculture that is good for animals and good for the land. 2. We already have enough hormones in our bodies without putting more in via Bovine Growth Hormone (BGH). And there’s never a good reason to take secondhand antibiotics. 3. Milk from organically raised cows is higher in Conjugated Linoleic Acids (CLAs) content – those are the good fats that have been linked to decreased heart disease and diabetes. 5. 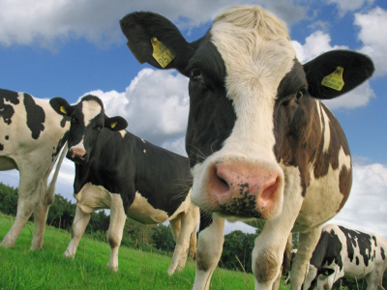 Organic dairy looks better and tastes better according to some. Do you spring for the good stuff? There’s no denying that the world at large is pretty dependent on oil for, well, just about everything. And that means that people are always on the lookout for new places to find it. 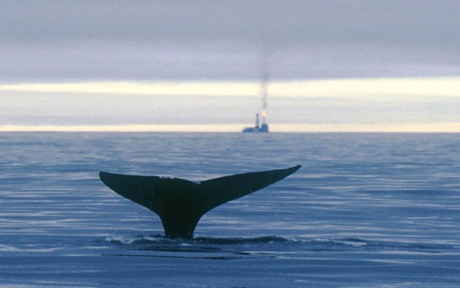 Just at this moment, the Sakhalin Energy Investment Company, which is partly owned by shell, is hunting for oil… in a stretch of the Pacific inhabited by a certain sort of gray whale that’s critically endangered. Their lives are already disrupted by oil exploration and exploitation, and the company already has two platforms in the area. The new one is planned to be near their primary feeding area, one of the only places where the sea is shallow enough to enable mothers to teach their young how to feed on the seabed. Does anyone else tear up a little when they hear about this sort of thing, or is it just me? It’s not that my brain automatically goes “oil bad, animals good” – I get that we still need oil and that oil has to come from somewhere. But 30 Western North Pacific gray whales of breeding age, all getting disoriented by seismic surveys and then having their only known feeding ground disrupted by the construction of a rig? Bleah. I may be a vegetarian now, but I wasn’t always. 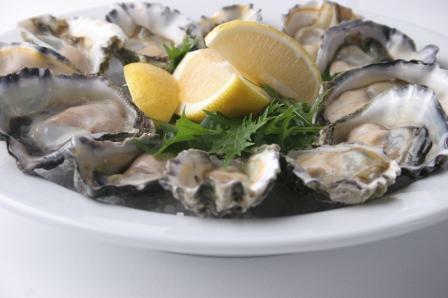 And back when you could find meat, fish, and fowl on my plate, I loved me some raw oysters. (So much so that thinking about eating them makes me miss my time as a devil-may-care carnivore, actually. *sniff*) Maybe you love oysters, too? In which case, consider nibbling on the wild caught variety now while you can still afford it because a survey of oyster habitats around the world has found that the tasty mollusks are disappearing at an alarming rate. In fact, 85% of their reefs have been lost due to disease and over-harvesting. That’s worldwide, not just in my or your backyard. In fact, if you want to talk about backyards, it’s mine that’s the least affected by pollution, overfishing, and the introduction of non-native invasive species. Seventy-five percent of wild oyster beds can be found in just five locations in North America, according to a study published in BioScience, the journal of the American Institute of Biological Sciences. But of course it’s not just about making sure there are plenty of tasty halfshell platters to go around – particularly from my perspective as someone who doesn’t get to slurp them down anymore – oysters are important to the ocean ecosystem because they filter impurities from seawater. If you’ve heard of declining oyster reefs in your area, do these mollusks in decline a favor and ask your local politician to look into a harvesting hiatus until the oysters have had a chance to rebuild their numbers. P.S. – Check out today’s post over at Manolo for the Home – Karl Zahn has created a beautiful way to recycle shipping pallets. Too bad all that recycling is so pricey! It’s confession time: I live in a vegetarian household, which means not only do I not eat meat, I also don’t wear clothes made out of fur or leather or anything else that was worn by an animal first. Most of the time. We have relaxed rules ’round here – secondhand leather is not a problem. I guess I could do secondhand fur, if I wanted to, but it’s not my thing. Sometimes, though, like-new secondhand this or that is just not available, and I have to go looking for an animal friendly substitute. And when I do, I’m often left wondering whether I am doing the green thing or the animal-friendly thing or both by buying a faux leather satchel or knee-high boots. As it turns out, as much as I’d like to see leather and faux-leather duke it out in the enviro-ring, it’s not as easy as ‘two textiles enter, one textile leaves’ because faux leather is not just one textile. Sometimes, faux leather is PVC, which does not biodegrade, leaches toxic nastiness in landfills, and emits dioxins when burned. Phthalates are what make PVC feel more like a leather bag and less like a plumber’s pipe. Lisa Finaldi, a Greenpeace Toxics Campaign Coordinator, has called PVC the most damaging plastic on the planet. On the other hand, sometimes faux leather is made of polyurethane, which is apparently somewhat more environmentally-friendly to produce – no solvents are required to make it feel soft – and will apparently biodegrade because it’s designed to deteriorate after usage. It’s also hardier, with many PUs leather-tested for durability. If asked, most people (I think) would say that real leather is always going to be greener than faux leather, but that’s not necessarily the case. To turn a hide into a nice soft material for jackets and bags requires a chemically-laden process that uses heavy metals and cyanide-based sollutions, as well as other unpleasant stuff. Industrial tanning, from what I’ve read, can be exceptionally harmful to the environment and the people who oversee the tanning process. Then there’s factory farming – the US Environmental Protection Agency has stated that livestock pollution is the most damaging threat to American waterways. But still, PU is a petroleum product, and there are recycled leather products and leathers that are tanned with enzymes instead of the usual chemicals. Unfortunately, an environmentally-friendly shopping spree will usually require the shopper to make certain trade-offs. If the choice is between leather and faux leather, it depends on the faux leather and it depends on the leather. How often are labels (or store employees) going to fully disclose what it is and where it came from? My guess is that unless you’re shopping somewhere rather high-end, not often. Do you consider the source of your leather or the composition of your faux leather when buying a pair of shoes or an office chair? Are Eco-Friendly All-Natural Cosmetics Really Natural or Green? Does It Matter to You? Lipstick’s initial destination is on the lips, but it’s final destination is often in the mouth. Likewise, some amount of eyeshadow and eyeliner will get into the eyes, powder that’s by the nose can end up inhaled, and even makeup that’s not near anything in particular can get absorbed into the first few layers of skin. So while cosmetics and beauty products are largely thought of as being for external use only, the fact is that those of us who wear makeup are eating it, breathing it, and getting it into our eyes. So I’d say yes, it’s worth the trouble and the expense to seek out cosmetics that are made with natural, organic ingredients that haven’t been processed too much. For those who only buy cruelty-free, there are even vegan lipsticks and eyeshadows that contain nothing that came out of an animal. A riparian zone or riparian area is the interface between land and a river or stream. Riparian is also the proper nomenclature for one of the fifteen terrestrial biomes of the earth. Plant habitats and communities along the river margins and banks are called riparian vegetation, characterized by hydrophilic plants. 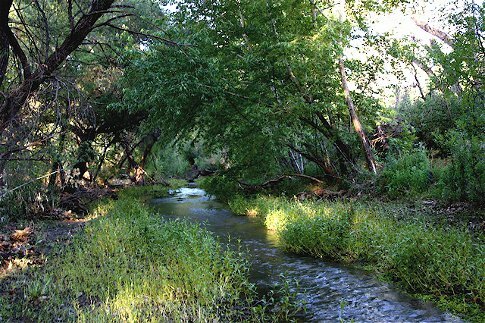 Riparian zones are significant in ecology, environmental management, and civil engineering because of their role in soil conservation, their habitat biodiversity, and the influence they have on fauna and aquatic ecosystems, including grassland, woodland, wetland or even non-vegetative. In some regions the terms riparian woodland, riparian forest, riparian buffer zone, or riparian strip are used to characterize a riparian zone. Well, huh. It never really struck me before, but now that I think about it, it’s pretty obvious that the strip of land on either side of a body of running water will always be important and often a bit different from the surrounding landscape for a variety of reasons. Riparian, riparian, riparian! It’s one of those words I think I’ll be glad to have picked up in the future, and I hope you’ll keep it in the back of your mind, as well. Ghost nets? Ghost fishing? Sure it sounds cool, but it’s actually pretty gross. What I didn’t know and what you may not know is that all over the sea going world, fishermen and women regularly discard old, worn out nets in the ocean. You might think, oh, how bad could it be, since they must sink to the bottom and settle there. Wrong. Those discarded nets actually float and, worse yet, just keep on fishing. 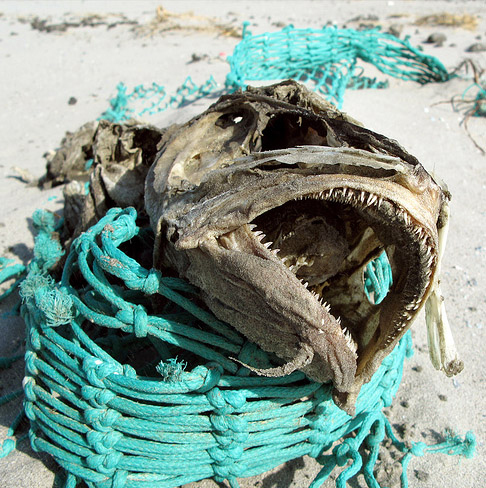 Ghost nets as long as 60 miles have been spotted floating around fishing areas and the open ocean, trapping hundreds of thousands of fish, aquatic mammals, turtles, and other living things as they move. They can also collect garbage, growing larger and more dangerous as they do, or even choke coral reefs to death. Luckily, there are groups out there who’s sole focus is finding and collecting ghost nets and taking care of animals who find themselves wearing pieces of old fishing nets. The Ocean Defenders Alliance, for example, has made it their mission to take dangerous man-made objects like ghost nets out of underwater habitats and liberate animals stuck in those nets. And then there’s Hawaii-based Nets to Energy and New England’s Fishing for Energy, both of which are committed to collecting ghost nets and recycling them for fuel. 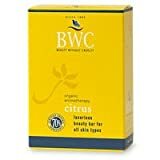 My personal faves are the rosemary, mint, and tea tree shampoo and the super gentle facial cleansers, but I’ve tried some of the other soap-type products and everything has ranged from good to wonderful. (Full disclosure: I have eczema so I have to use natural, non-irritating product or else.) Because I’m scent sensitive, one thing I really like is that the organic aroma-therapeutic essential oil scents are so mild. And one thing I’m not crazy about? Well, the BWC shampoos don’t get sudsy in your hair, which is hard to get used to, but that’s what happens when you take away sodium lauryl sulfate. 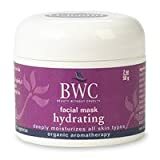 I’ll admit that I haven’t tried any of BWC’s cosmetics, but the entire line the company produces is suitable for vegetarians and vegans, and fragrance free. Natural ingredients are the norm and organics are used whenever possible, just like in their lovely soaps, shampoos, conditioners, moisturizers, and facial scrubs. On top of that, all BWC nail polishes are toluene, formaldehyde, and pthalates free, so you don’t have to worry about what kinds of icky things they’re doing to your fingernails. Do you have a favorite eco-friendly, cruelty-free, or organic brand for Green Manolo to check out? Tell us about it in the comments! high fashion sunglasses: In the world of high fashion glasses, what companies do you think lead the way?